Learn about dress shirt fabrics. 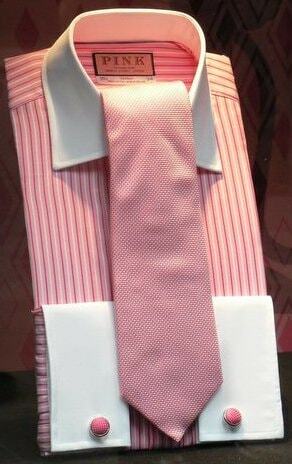 Neckwear, Dress Shirts, Hosiery, Underwear/Loungewear. Men's. Big & Tall, Dress Shirts, Hosiery, Neckwear, Sportswear, Underwear / Loungewear. Dress Shirts, Woven Sports Shirts, Knit Sport Shirts. Dress Shirts, Formalwear, Hosiery, Underwear/ Loungewear, Tailored Clothing. Dress Shirts, Formalwear, Sportswear, Tailored Clothing. Mercer & Sons: Maine / RI based high end dress shirt manufacturer: Made in U.S.A. The old-fashioned button down the way they used to be. G. Bruce Boyer. Baggier and Better Full Roll 3 7/16" Button Down Collars, Two-Ply, Yarn-Dyed Pima Cotton Oxfords, 2 7/8" Straight Point Collars, Generously Cut for Exceptional Comfort and Traditional Good Looks. Hard-to-Find Sizes, Sea Island Broadcloths, English and Italian Superfine Shirtings, Solids, Stripes, Checks, Plaids, French Cuffs, Contrast Collars, Short Sleeves, Big and Tall Sizes, Single Needle and Custom Tailoring Details. Impeccable after 150+ Launderings. Classic Pima Cotton Oxford Boxers. Big & Tall, Dress Shirts, Neckwear, Outerwear, Tailored Clothing. Accessories, Activewear, Denim, Dress Shirts, Footwear, Hosiery, Loungewear, Neckwear, Outerwear, Pants,Rainwear, Sportswear, Swimwear, Tailored Clothing. Accessories, Activewear, Dress Shirts, Formalwear, Hosiery, Neckwear, Outerwear, Pants (long & short), Sportswear, Swimwear, Tailored Clothing, Underwear / Loungewear. Pierre Cardin Coordination USA Inc. Accessories, Activewear, Dress Shirts, Formalwear, Hosiery, Neckwear, Outerwear, Pants, Swimwear, Tailored Clothing, Underwear.. Accessories, Big & Tall, Dress Shirts, Formalwear, Neckwear, Sportswear. Accessories, Denim, Dress Shirts, Neckwear, Outerwear, Pants, Sportswear. Accessories, Activewear, Big & Tall, Denim, Dress Shirts, Outerwear, Sportswear, Westernwear. Accessories, Activewear, Big & Tall, Denim, Dress Shirts, Formalwear, Hosiery, Neckwear, Outerwear, Pants, Sportswear, Tailored Clothing. Accessories, Big & Tall, Dress Shirts, Hosiery, Neckwear, Sportswear, Underwear / Loungewear. Takino Men's Pocket Dress Shirts & Accessories (Japan): Japanese Designer of Men's dress shirts and accessories. Shirt are designed with many special hidden pockets in cotton and treated with nanotechnology to prevent stains, odors and wrinkles. Activewear, Denim, Dress Shirts, Outerwear, Sportswear, Loungewear. Activewear, Denim, Dress Shirts, Formalwear, Hosiery, Neckwear, Outerwear, Pants, Sportswear, Swimwear, Tailored Clothing, Underwear / Loungewear. Big & Tall, Dress Shirts, Casual Shirts. Accessories, Dress Shirts, Formalwear, Outerwear, Pants, Tailored Clothing. Dress Shirts, Formalwear, Hosiery, Pants, Sportswear, Shirts, Tailored Clothing, Underwear.